Julien Lecomte of Yahoo! 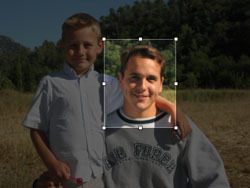 has written a YUI-based image cropper widget that allows you to easily select which region of an image youâ€™d like to crop. This widget works on all A-grade browsers in both standards mode and quirks mode. Oh, and you probably want to do something with a hook on the backend. Also, Julien has discussed implementing a scriptable XPCOM Component and an iPhone version of Y! Search. Neat! Anything out there for jQuery?